Habitat : The plant is indigenous to tropical and subtropical east asia. it is cultivated in south east china and in indo  china. Uses : Fruits are used as condiments for flavoring curries, confectionery. It is also used in Perfumery. Fruit is chewed to sweeten the breath and to help digestion. It is stomachic and carminative. It is used as an adjunct to cough mixtures and as corrective of taste. 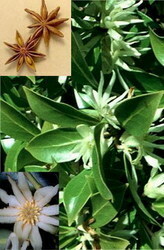 Star anise oil is used in perfumery and soaps. The oil is stimulant, stomachic, carminative, mildly expectorant and diuretic.